39mm x 31mm 18K rhodium-finish white gold case set with brilliant-cut diamonds, 8.6mm thick, octagonal crown crown set with a brilliant-cut diamond, 18K rhodium-finish white gold bezel set with brilliant-cut diamonds, silver dial, manual-winding movement with sword-shaped hands in blued steel, 18K rhodium-finish white gold bracelet set with brilliant-cut diamonds. Water resistant to 30 meters. 39mm x 31mm 18K white gold case, 8.6mm thick, octagonal crown set with a faceted sapphire, 18K white gold bezel, silver dial with sunray effect, caliber 430 MC manual-winding movement with blued-steel sword-shaped hands, black alligator skin strap, ardillon buckle. Water resistant to 30 meters. 39mm x 31mm 18K white gold case, 8.6mm thick, octagonal crown set with a faceted sapphire, 18K white gold bezel, silver dial, caliber 430 MC manual-winding movement with blued-steel sword-shaped hands, 18K white gold bracelet. Water resistant to 30 meters. 39mm x 31mm 18K rhodium-finish white gold case brilliant-cut diamonds, 8.6mm thick, steel back, octagonal crown set with a brilliant-cut diamond, 18K rhodium-finish white gold bezel set with a brilliant-cut diamonds, silver dial with sunray effect flinqué, manual-winding movement with sword-shaped hands in blued steel, mineral glass, fuchsia-pink alligator skin strap, folding buckle. Water resistant to 30 meters. 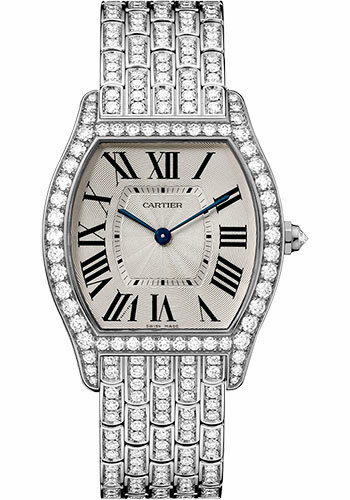 39mm x 31mm 18K rhodium-finish white gold case brilliant-cut diamond, 8.6mm thick, steel back, octagonal crown set with a brilliant-cut diamond, 18K rhodium-finish white gold bezel set with a brilliant-cut diamonds, silver dial with sunray effect flinqué, manual-winding movement with sword-shaped hands in blued steel, mineral glass, 18K rhodium-finish white gold bracelet. Water resistant to 30 meters.